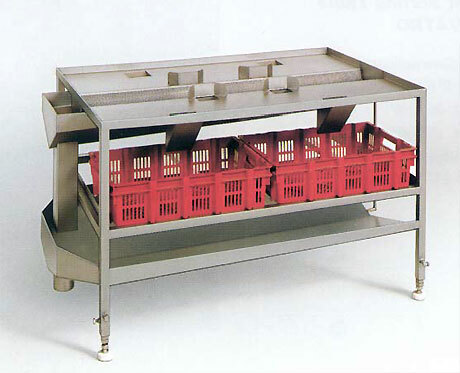 The Giblet Sorting Table makes for a fast and precise sorting for the central offal discharge. With its quickly adjustable working height, this sorting table optimises the processing of giblets in your plant. Sorting can be carried out by four persons at the same time. During this process, the sorted parts slide through openings into containers arranged under the table. Waste is carried away centrally via a collection gutter. It features incorporated spray nozzles and an adjustable amount of spray water.